The problem most vacuums face when picking up fine dust is loss of suction. This loss of suction is caused by the dust particles blocking and clogging up the vacuums air filter. This blockage shortens the life of the air filter and ads harmful strain to the vacuum motor. There is also the fact that many shop vacuums do not do a very good job of filtering out fine dust. 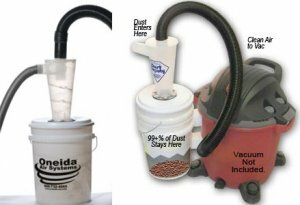 The Dust Deputy from Oneida Air Systems is kind of like a pre-filter attachment for your shop vacuum. Using the power of the cyclone, the Dust Deputy separates more then 99% of the dust into a bucket, before it even makes it to the vacuum. This allows your vacuum to work more efficiently and also greatly reduces your cost of replacing filters.